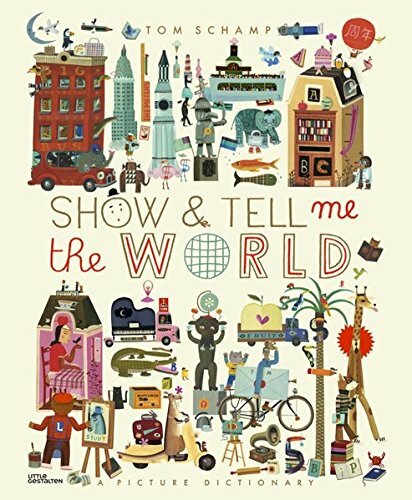 Show & Tell Me the World by Tom Schamp is an oversized picture book dictionary with a smattering of everything from houses and food to the four seasons; from air, land, and sea creatures to a traffic jam of vehicles both recognizable and fantastical; from arts and sports to city and country with illustrations that jam together Richard Scarry’s Busy, Busy Town with Martin Handford’s Where’s Waldo. Tom Schamp is an illustrator based in Belgium with a background in graphic art and design. He has published several children books, only a few of which have been translated into English, such as his board book Otto in the City (2014), and he illustrates for a number of publications. An abundance of colors, quirky characters, and wacky wonders make Show & Tell Me the World unique; however, overall this book is a massive sensory overload that can only be absorbed by the intended four to eight year olds one page at a time. This is hardly a going-to-bed or a winding-down book. Starting with the facing pages six and seven, the reader is introduced to a “Who’s Who” of 20 or so characters and a dizzying array of fonts that are meant to guide the reader throughout the pages. Although this is not clear from the outset, the reader is meant to join a young critter named Otto as he points out everything there is to see in this world we live in. The reader is also encouraged to find and follow five caterpillars (one of which is a microscopic replica of Eric Carle’s Very Hungry Caterpillar), through out the book. The caterpillars are so tiny and the following pages so busy, it was nearly impossible to find them again once the first page is turned. These first pages are confusing, and the rest of the book follows suit. While many of the individual graphics are fun, upbeat, and interesting, and there are some clever illustrations like the cross section of the ferry on the ships pages and the night at the opera house on the very last pages, the book is fraught with design problems from start to finish. Page after page the reader is faced with layouts that are too busy, hold no graphical hierarchy, are devoid of intuitive organization, crammed with typography that is hard to read, and provide no negative space on which to rest one’s eye. Many pages are so dark and the fonts so small and black that it is nearly impossible for an adult to read let alone the targeted age group. With artwork this chaotic, it is hard to believe that Schamp is a trained graphic designer. One other issue that begs to be mentioned is the lack of any story. If there is one, it is well hidden among the artwork. The front cover does describe the book as a picture dictionary, but if that is the intention, it falls short there as well due to the fictional, imaginary nature of the majority of illustrations and the lack of an organized progression of some kind be it alphabetical or otherwise. Even nonfiction children’s books should have a beginning, middle, and end. The redeeming feature of Show & Tell Me the World is that there is still a certain gestalt-like charm with how Schamp sees the world. And if one is willing to take it slowly and allow time to absorb and explore, then something new will be seen each time a page is visited.